help older Americans live longer, healthier, more independent lives by promoting increased physical activity, and sound health, and nutrition practices. 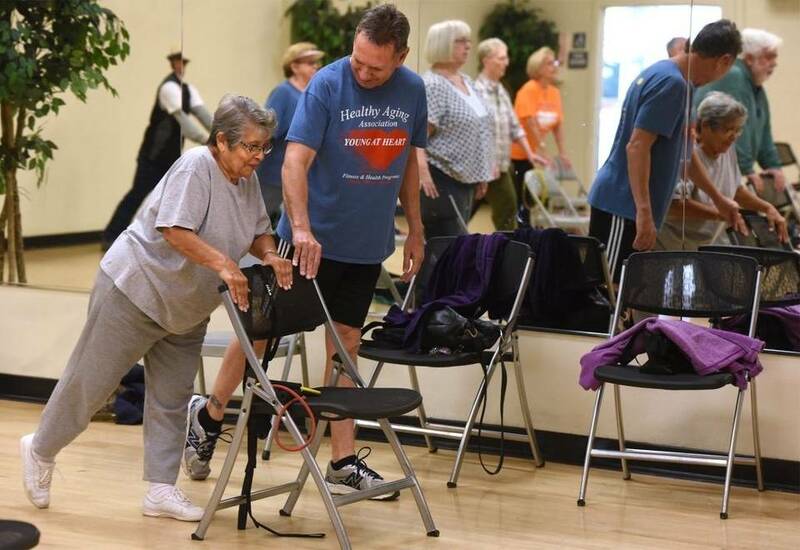 Healthy Aging Association provides Older Adult Fitness Classes right here in Stanislaus County. There are 81 weekly Young at Heart Classes in Modesto and neighboring areas. Our Young at Heart Classes are designed to help our community improve function, to help maintain independence, to increase quality of life, and to reduce the risk and number of falls in those over 50 years of age in our community. Click to find out which one of our 30+ Class Locations is closest to you. Certified Young at Heart Co-Instructor Bob is demonstrating a modification for a participant so she is in a pain-free range of motion. The State Department of Aging, the Department of Health and Human Services, and the U.S. Department of Agriculture, Food and Nutrition Services recognize the Young at Heart Program as an Approved Practice-Tested Intervention. Our Young at Heart Program was presented at the American College of Sports Medicine (ACSM) World Conference in May 2014. View the entire ACSM poster presentation now. Young at Heart - A Community Based Fitness Program was presented at the American Society on Aging (ASA), Aging in America conference in May 2015 in Chicago (View the ASA Presentation). Watch the opening session from the ASA 2015 Conference.